Some countries use fahrenheit, others use celsius, and if you’re an alien on an unusually extreme planet maybe you even use kelvin… whatever the case we’ve all run into the situation where someone from elsewhere is referring to a temperature in a scale you’re unfamiliar with. Obviously if someone in the USA says “wow it was 10 degrees!” that means it’s really cold weather, but if a native German said the same thing, that’s quite mild weather. Rather than trying to do the funky math in your head, just ask Siri. No, she won’t report the weather back directly in another temperature scale (we’ll cover that through a Settings adjustment, however), but she will perform temperature conversions from celsius to fahrenheit and vice versa. You get the idea. Siri will quickly give you an answer under “Result”. If you look under the “Additional conversions” section, you’ll find Siri has also provided the temperature converted into other scientific formats too, like kelvins and Rankine. 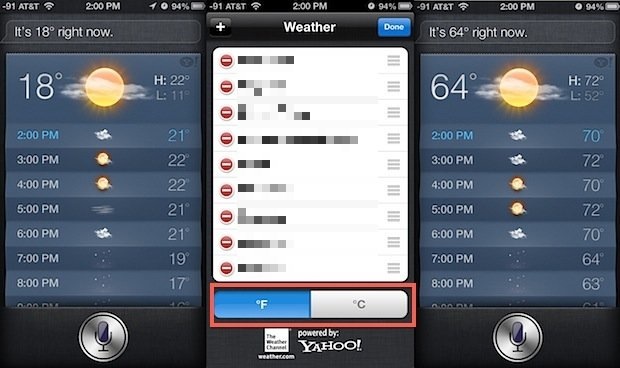 Now ask Siri the weather again, it will be reported back whichever you chose, farhenheit or celsius, depending on the settings in Weather app. At this point, you can’t ask Siri directly for the current temperature of a location in another format, but by switching the setting in Weather you will end up with the same effect. 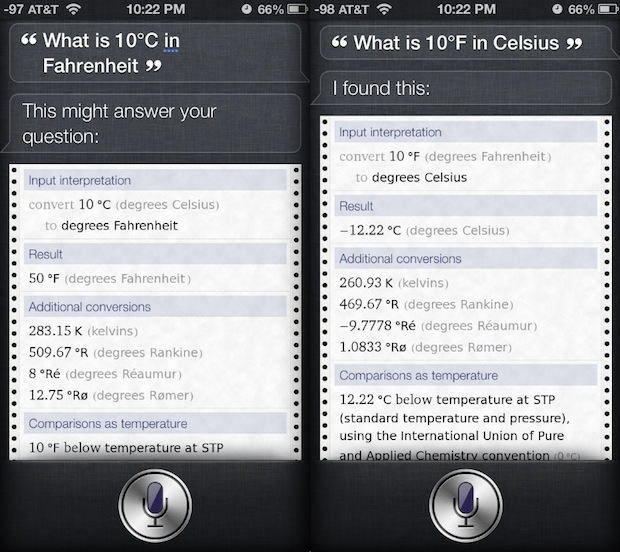 Wondering what else you can do with Siri? Don’t miss the huge list of Siri commands. Only Liberia and Burma use Fahrenheit officially. Celsius, is officially the standard in the United States, but since Americans like to “phase things in” (which means “never switch”), Fahrenheit is still in use in everyday life. Many people have never heard of a Fahrenheit and don’t know what it is. I understand that some people still use Réaumur in Belgium, so the USA isn’t the only country that is a slave to tradition. One day the rest of the world will catch up with us. I salute Liberia for starting the rush. This is THE most helpful SIRI advice on temparature setting. I have gone through so many forums. Thank you.